Although Laos is an adventurer traveler’s dreams and is naturally stunning, one might be ready for a little luxury and culture. That’s just what I needed, so after spending a day kayaking, trekking and riding elephants, I decided to let my travel companion train and play with elephants on her own while I spent a day exploring the culture and beauty of Luang Prabang as well as enjoy its tranquility. Luang Prabang is a Unesco World Heritage Site; therefore there is a wonderful absence of the usual truck and bus congestion. This makes shopping and dining (loads of wonderful shops and restaurants) more enjoyable for all. There are a number of Buddhist temples worthy of much more than a cursory glance. You will see a number of saffron-robed monks around the temples and city, most notably the Tak Bat. Each morning, the monks of Luang Prabang quietly pad down the cobblestone streets gathering rice and alms from locals and tourists alike – a must see if you can get up early enough. 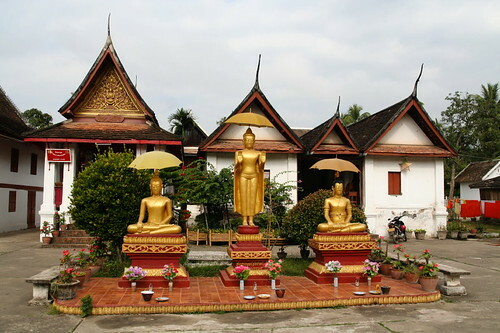 Luang Prabang, once the seat of the Laotian Monarchy, boasts its own Royal Palace, which is now a museum. It is diverting to see how the royals lived, plus is inexpensive and is a quick tour – all good in my book. You can also check out interesting gifts from foreign dignitaries and some pretty sweet rides in the garage! Just across from the palace is the trailhead to Phou Si Hill, a charming walk to the top (at just 325 feet) is dotted with shrines and temples, as well as some fowl and lovely foliage. You won’t even notice how sweaty you have become once you see the breathtaking views of the Mekong and green hills that surround you. Wandering around, you will find temples, caves and numerous Buddha statues, even Buddha’s footprint. As there are many routes to get up and down, I recommend retreating down the back where you will come near a monastery. I ended the day, tiring in its own rite, with a $5 Lao massage (similar to the Thai massage) and a cold drink on the main drag, giving me energy for the night market later.